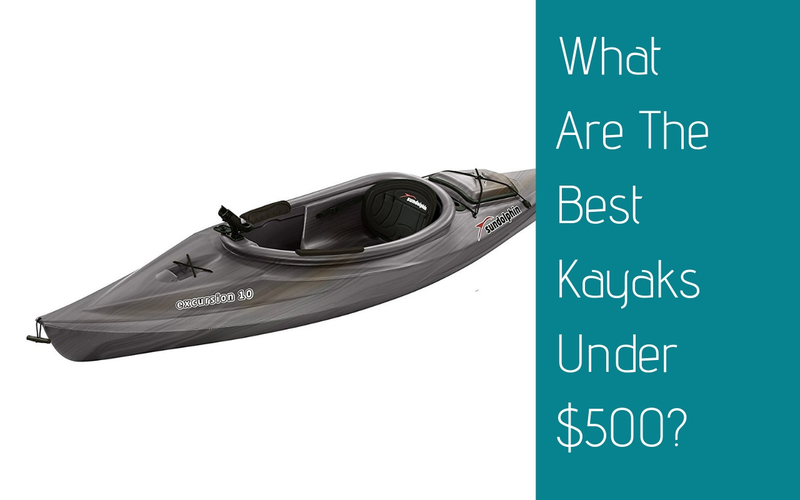 What Are The Best Kayaks Under $500? Buying a decent kayak doesn’t mean breaking the bank. If you think you need to spend thousands of dollars to get a safe and durable kayak, you are mistaken. From recreational kayaks, fishing kayaks, and even whitewater kayaks, there are options out there that are not only up to the task, but affordable as well. So whether you want to stick to your budget, or just don’t want to spend a lot of money on a kayak, there are great options out there for under $500. Kayaks with little to no stability can be not only a pain to use, but dangerous if you aren’t experienced. So stability is a major factor when looking for your next kayak. As a good rule of thumb, the wider the kayak is, the more stability you will get. You should consider how fast you plan on moving through the water in your kayak. The type of kayak you choose will greatly impact how quickly you are able to move through the water and how much effort it will take to get to the desired speed you want. If you will be kayaking in an area with a lot of rock and debris or strong waves and currents, durability is crucial to keep yourself safe and your kayak in one piece. If your kayak isn’t durable enough to handle your trip, not only will it be a waste of money, but very dangerous as well. Maneuverability is not a huge problem if you only go kayaking in open bodies of water like large lakes and oceans, but is a huge must have if you want to kayak on rivers or bodies of water that have any twists or turns. So you really need to plan ahead when looking at kayaks and make sure they will be able to maneuver on the water as you go without worrying about crashing or capsizing. If you are interested in fishing or overnight kayaking trips storage is a must have. Try to look at the amount of gear you need to bring and keep that in mind when you are looking at kayaks. It is better to have extra storage rather than not enough. This is especially important for anyone looking for a fishing kayak. Look for places that you can mount your gear and secure them so you can easily access what you need without worrying about it falling off. If there aren’t set places for these things, look for where you could customize the kayak and make things your own. There are two types of seating designs for kayaks; the sit in and the sit on top. The sit in kayak seat design is the standard design for kayaks and is also known as a cockpit seat. The sit in design is ideal for more high velocity kayaking like whitewater or kayaking on strong currents and big waves. They are also the ideal seating for cold weather so you can better block the water from hitting your body. They can also come with foot pedals and spray skirts, unlike the sit on top option. Sit on top kayak seating is a great option for more leisurely kayaking like tours or recreational trips because they are much easier to get on and stay on than the sit in seat. They are ideal for beginners as well because it takes little practice to master getting on and off. But you will get splashed with this type of seat and there are no pedals so you should opt for this seating option in warmer temperatures and in areas where you can rely on your arms and the paddle to make it to and from your destination. If you plan on kayaking with a friend, or even bringing your dog along for a paddle around, you should look into getting a tandem kayak. Providing two seats is not only a great way to save money and share the kayaking experience, but can be a great option for those who need extra storage space. The type of hull on your kayak also impacts the level of stability you will get so it is important to recognize the difference between them and choose the right one for you. There are five main types of hulls you need to consider; flat, rounded, v-shaped, pontoon and chine. Flat hulls are by far the most stable and have the most maneuverability of all the different types of hulls. This makes them great for beginners and those interested in more recreational kayaking. Rounded hulls are ideal for those who want more speed while maneuvering a variety of twists and turns. While they don’t have as much stability as the flat hull, the rounded hull has great secondary stability when tilted. V- shaped hulls are ideal for moving very quickly in a straight line. This makes them perfect for tours, long distance treks and recreation. This type of hull has the least amount of stability but does have decent secondary stability. Pontoon hulls have the most overall stability with primary and secondary stability both being high. But with the most stability, this type of hull is by far the slowest of all the kayak hull options. Lastly there is the chine hull, which can be either a hard chine, a soft chine or a multi chine. The softer the chine, the greater the secondary stability. The weight of your kayak is another important factor, even though it is often overlooked. A kayak’s weight matters because you need to be able to carry it to and from the water without hurting yourself or dragging it. Dragging the kayak can cause major problems and damage your kayak’s structural integrity, making it useless on the water. It is also important to consider the kayak’s weight capacity to make sure you and your gear don’t exceed it. The length of a kayak helps determine how well it will handle turns and how quickly it can go. Longer kayaks are great for moving quickly in a straight line. While shorter kayaks more stable and can turn more easily. The kayak’s length also determines how and where you can store and transport it so plan ahead to make sure you can properly care for it to prevent any issues. The type of material used for your kayak can impact your kayak’s durability, weight and speed. While common materials like plastic, aluminum, fiberglass and wood all have their pros and cons, but it is important to remember that the higher grade materials will cost more. So for your first kayak most experts recommend getting a strong plastic so you get a relatively durable kayak without being too heavy or having to spend too much money. Color may not seem like a big deal, but it is an important thing to consider when buying your kayak. While it is always good to choose a color you are fond of, there are more practical purposes for your kayaks as well. For example, do you want to have a kayak that blends into the environment? If so it will be more effective to choose a green or brown color. But if you want to guarantee higher visibility to make it easier to spot you in case of emergencies, it is important to go with a bright and bold color that will stand out among the surrounding environment. Ideal for lakes and rivers, the Sun Dolphin Excursion SS kayak is a fantastic and affordable fishing kayak that can also be used for touring and general regulation. 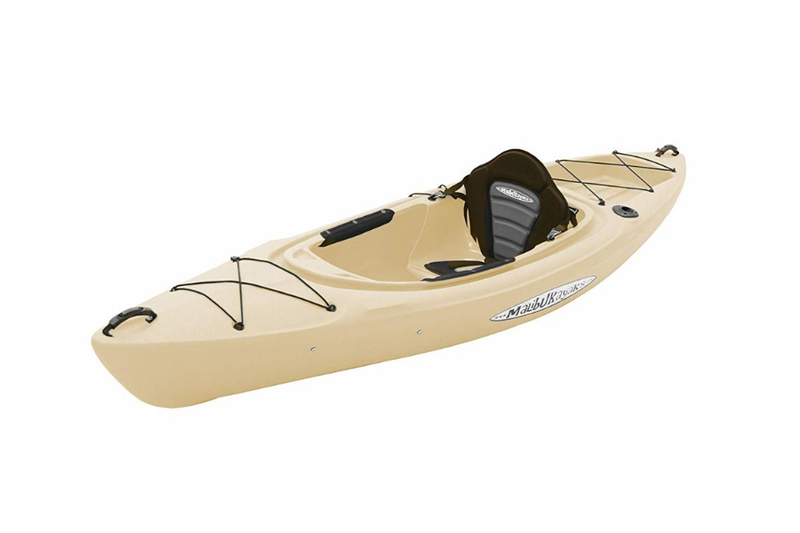 It comes with a hands free electronic console and plenty of additional features that makes it perfect for someone who wants a kayak with plenty of bonuses without breaking the bank. The sit in style seating is extra comfortable because of the wider than average cockpit, padded adjustable seat and padding around the thighs. The Excursion SS also provides you with a paddle holder, two flush rod holders, a swivel rod holder and even a water bottle holder. The Excursion SS is only 44 pound in weight and comes with a carrying handle to make it easy and efficient to move your kayak from the car to the water and everywhere in between. The 30 inch with allows for greater stabilization and the 14 inch height will help keep you dry. There is a storage hatch in the stern, but if you don’t think that will cut it the Excursion SS also comes with a portable accessory carrier, or PAC that provides extra space to store all your things. 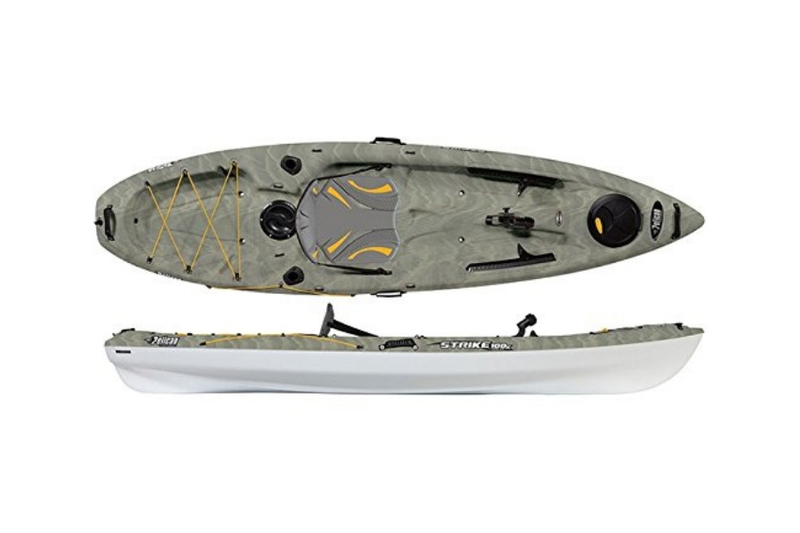 With more storage than any other fishing kayak under $500, or any 10 foot kayak of any price, the Malibu Kayaks Sierra 10 Pro Series Fish and Dive sit in kayak is a must have for anyone who has a lot of gear. The larger than average cockpit allows you to move around freely and the internal storage in the front of the kayak makes it easy for you to access your gear. The rear storage can accommodate a five gallon bucket full of bait easily, or use it for additional gear that may not need to be as accessible. 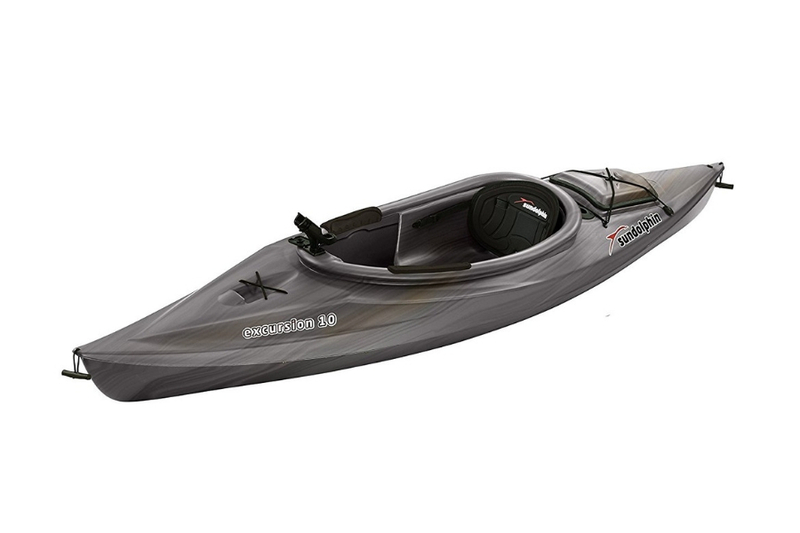 The Sierra 10 kayak also features a built in GPS system and fish finder, as well as the standard features kayak users have come to know and expect. The durable material and rod holders make it a great kayak for fishing, while the overall design allows it to use used for recreational and touring trips as well. The wide 31 inch design will provide added stability and the 15.25 inch height will help keep you dry as you paddle to your destination. With a maximum weight capacity of this kayak is 325 pounds so you can bring all your gear, while only weighing 48 pounds itself. The kayak also comes with carrying handles in the front and back to make it easy to transport. Available in 12 foot options as well for a little more money, the Perception Pescador 10.0 is just over ten feet at 10 feet 6 inches long and is available in six different colors. The colors range from more muted and environment blending camo and very bright options that will keep you visible in any situation. With a 32 inch width, the Pescador 10.0 has incredible stability, is steady on the water and is easier than most kayaks to get in and out of. The two fixed fishing rod holders, paddle holder, drink holder and mounting resources all make it easy to access your gear and there are plenty of storage options to store everything. There is an open tank well in the rear of the kayak with bungee cords to keep your gear secure, while in the front you have a hinge operated dry storage container to keep everything within arm’s reach. The Perception Pescador 10.0 is designed for comfort with back friendly seats that are both cushioned and adjustable. The ergonomic seat also has ventilation in the foam to keep you from getting too hot and the sit on top design makes it easy for even the worst backs to get in and out without difficulty. There are also foot rests and enough space to keep your legs comfortable for hours at a time. While the last kayak on the list, the Pelican Strike 100X Angler is definitely not lacking in features. With a 10 foot body length, 30.5 inch width and 16 inch height, the Strike 100X Angler provides stability as well as protection to keep you dry. The seat is made of a padded Ergoband material that supports your back and an adjustable footrest to provide the greatest comfort you can get in a kayak. The Strike 100X Angler also features two hatches with one able to lock and an open tank well in the rear of the boat with bungee cords to provide the most storage options they possibly can . 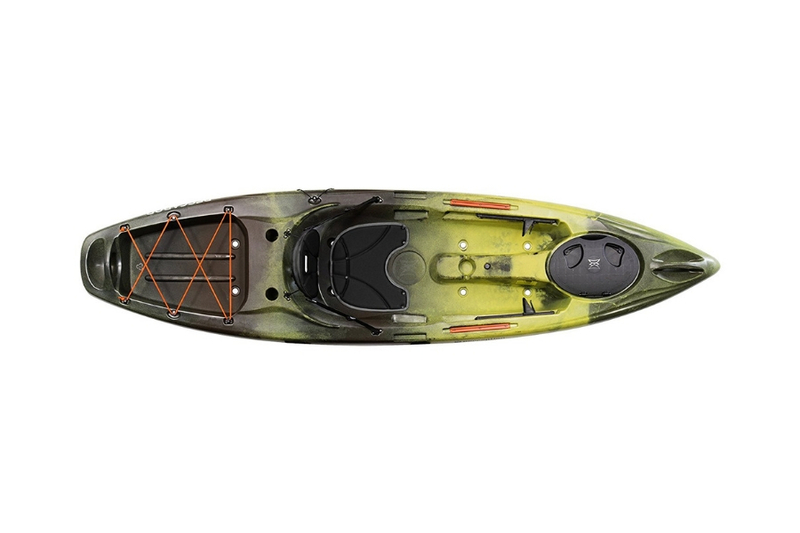 The hatches are 8 inches with a bag include and additional features like bottle holders, rod holders, paddle ties and carrying handles all add up to a fantastic kayak for fishing under $500. Looking for the best Kayaks that cost less than $500? Then this article is for you, it'll give you the best idea of what kayak is best for you.